Bit of a different post for me today, I have never done an instructional post before but so many bloggers and my blogging friends have been complaining about picture sizes and formatting lately I thought I could write this post. I use Blogger so I'm afraid that's what I am referencing in this post, sorry if it doesn't help you but it might give you something else to think about. 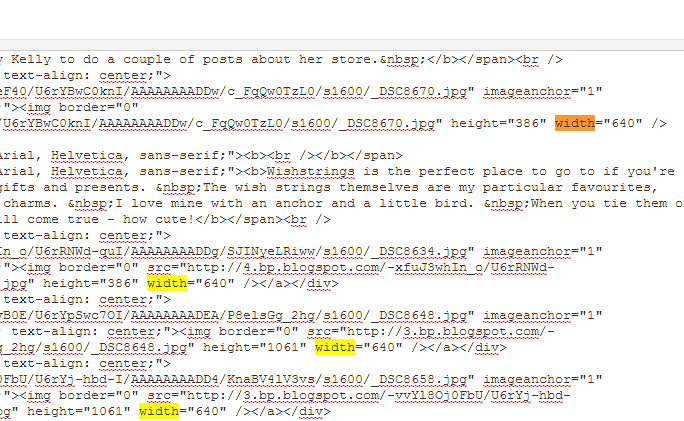 I used to use the Blogger tab to choose my picture sizes. I think that the bigger the photo the better so I always go for Extra-Large. But I was finding that this meant that the landscape and portrait pictures were bigger but didn't align. I think this looks a little unprofessional and disrupts the flow of the post. You can see this in my older posts, like here. So after this annoying me for weeks I asked the boyfriend how to fix it and he taught me! So now I can teach you guys too, if you want! Since doing it I'm so much happier with the look of my blog. I think it looks so much more professional and clean looking- you can see it in posts like this one. Write your post like normal and import the photos. Setting them to as close to your chosen size as possible the normal way. Then head up to the HTML button and give it a click. It's going to turn your page to what looks like gobbly-gook to people uneducated like me. Hit Ctrl+F and type in width. This highlights some of the gobbly-gook and this is the height and width of photo. Since we want all the widths of photos to be consistent you need to pick a number and stick with it. I go for 640px since this is as wide as my blog body allows and is also conveniently the width of my landscape photos already. All I want is for my portrait photos to match this. So I skim down to any of the widths that are NOT 640 and look at the proportions. I then open up this Aspect Ratio Calculator and fill in the height and width I can see in my blog post. I then put 640 into the second width box and this tells me the height that photos need to be to keep them in proportion. Back to blogger, I switch in these values to the portrait photos. Click again on Compose and bam! Your post is in beautiful alignment. I hope this is helpful for you! Although you might need to tinker with exact sizes so you can find ones that you are happy with, I just showed you what I use. Yay, glad I could help! It's such a simple trick but it makes such a difference! THANK YOU SO MUCH….that is all I needed!